In the early age of my forex trading career, when I was studding the ABC of forex trading, I got introduced with the very popular Relative Strength Index (RSI),dramatically. I felt like I discovered the best tool to win in the currency market. I wish, if I would have been correct. I started trading with RSI indicator with a bonus account, specially, I was scalping in the market. When my statement became rich with losses, I started searching another way to trade the currency market. Ohhh!!! I was walking along the road with my friend AR Shagor. I was sharing with him that I discovered a way to make good profit in currency market, which was trading the news. I said him that I found an economic calendar where so many economic news are released and that move the market. He was very happy about my discovery. We decided to invest our real money. Next day we deposited our account by $100, that was bought from one of our friend Shumon, who was a freelancer. We both were sitting before our trading platforms and connected through skype. We were actually waiting for an economic news of EUR. The news was released and the actual figure was higher than forecasted figure. We went long on the EUR/USD currency pair. The result was frustrating, we both lost our whole capitals. However, news trading is profitable, but very risky. Before you trade the news, you must have the knowledge of fundamental analysis. Here I am going to introduce you with a news trading system applicable to currency trading. The system should be applied to trade the news that has medium to high significance. The strategy to trade with this system is very simple.This system should be applied on the 15m or 30 m charts. Any currency pairs can be traded with this trading system. 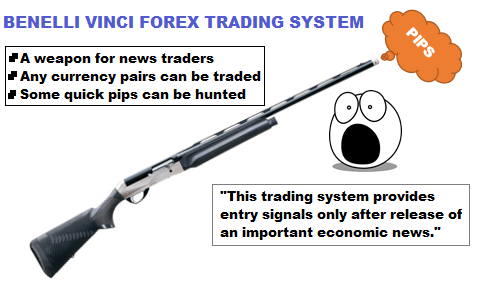 How to execute a long trade with "The Benelli Vinci" forex trading system? (a) Go long, if the actual figure released is higher than the forecasted figure by 20% (base currency). (b) Go long, if the actual figure released is lower than the forecasted figure by 20% (counter currency). 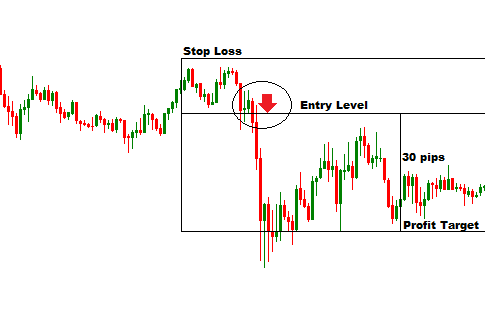 (c) The stop loss for the orders can be placed at the lower support level or 20 pips lower than the entry price. (d) The profit target can be placed 30-100 pips higher than the entry price depending on the significance of the news released. How to execute a short trade with "The Benelli Vinci" forex trading system? (a) Go long, if the actual figure released is lower than the forecasted figure by 20% (base currency). (b) Go long, if the actual figure released is higher than the forecasted figure by 20% (counter currency). 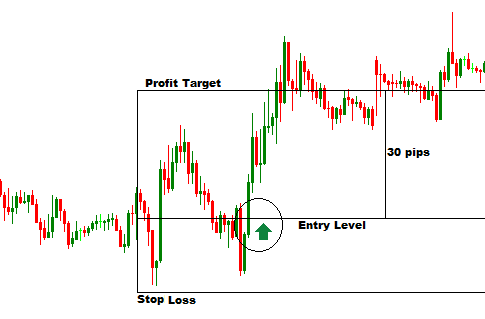 (c) The stop loss for the orders can be placed at the higher resistance level or 20 pips higher than the entry price. (d) The profit target can be placed 30-100 pips lower than the entry price depending on the significance of the news released. This trading system is applicable to trade any news that has medium to high significance. Some economic releases e.g. NFPs can be traded even the 20% rule is violated. If the traders have the deep knowledge of fundamental analysis, they can trade any news regardless the figure of the news released.